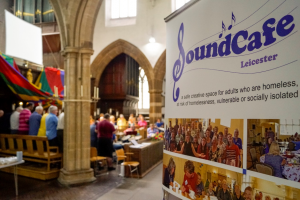 We are delighted to write about another successful grant awarded under our Community Grant Scheme to the Sound Cafe in Le icester. 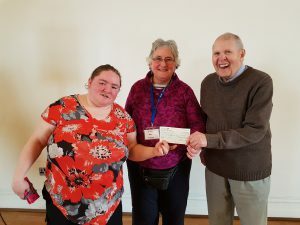 Trustee, Roz Burch, along with two attendees were happy to receive our cheque (pictured here). Clockwise Development Officer, Joe, went to visit them on Wednesday at St. Martin’s House, where they hold a drop-in between 1.30 – 3.00 pm every week (with choir practice afterwards). 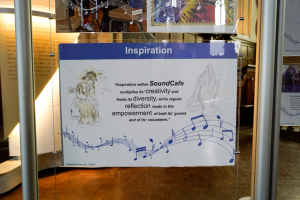 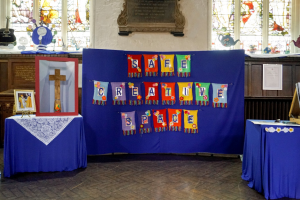 Sound Cafe provide a safe creative place for anyone who is homeless, under threat of homelessness, vulnerable or socially isolated to have a voice through arts & crafts, poetry, music, singing and always have cake. 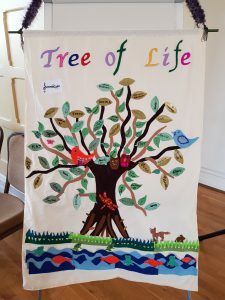 On Good Friday the Sound Cafe choir sang in Market Place Leicester at the statue of Alice Hawkins, where an image of the fantastic Tree of Life project (featured here) and other art work was projected onto a big screen for everyone to enjoy!